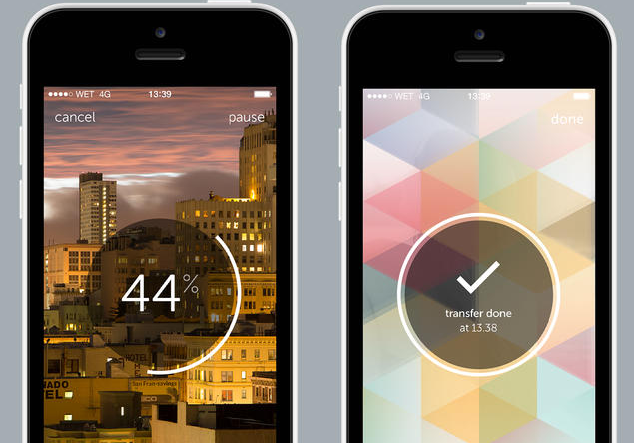 WeTransfer, the service for sending large files across the Web, has just launched its first iOS app designed to speed up the process of sharing hi-res photo or video files from a mobile or tablet. Initially geared just towards uploading and sharing videos and photos, the WeTransfer app will allow up to 10GB of files to be shared directly from an iPhone’s Camera Roll over either a 3G/4G or WiFi connection. Handily, the app has no problem switching between a mobile data connection and WiFi, so if you need to pause a download part way through – or you lost connection – there should be no problem there either. Naturally, if you’re on a plan with a metered mobile data limit, you might want to save the largest uploads or downloads for when you’re connected to WiFi once again. To make it easier to manage your files, WeTransfer has incorporated gesture controls into the app, for example, you can find images quickly by swiping with two fingers to jump between months or you can skip to the last image in a folder by swiping with three fingers. The app is available to download and use for free, but WeTransfer ‘Plus’ account holders can store up to 50GB of data in the company’s own cloud for accessing from any device. The Plus membership costs a flat fee of $10 per month, charged as an annual payment of $120. From the sounds of it, this is only the first step in the company’s bid to build out a wider platform, so we wouldn’t be surprised to see this extended beyond photography and video files in the near future. While it’s only available for iOS devices for now, WeTransfer told TNW that it is hard at work on delivering an Android version in the near future too.